This video is a little bit creepy but fascinating to watch as it shows a swarm of Malaysian Trumpet Snails consuming a patch of algae on the aquarium glass. It also demonstrates just how useful snails can be! thanks so much for your blog; it helps a lot. I'm starting my own planted aquarium, and i was wondering If I needed to change the water in the aquarium if i was only having plants in the aquarium. If I did, how often and how much? just wondering, but how MANY snails do you have in that aquarium? They look effective, but it looked like there was quite a lot...wouldn't a large aquarium be needed to facilitate that many snails? i was wondering If I needed to change the water in the aquarium if i was only having plants in the aquarium. If I did, how often and how much? General rule of thumb is 10% every week. If you fertilize using the Estimative Index, 50% per week is recommended. Changing the water replenishes the trace elements that can be depleted by growing plants. It wasn't my tank, but it looks like they have hundreds of them. However, you don't need nearly that number to be effective, it just won't be cleaned as quickly. And the waste produced by 1 snail is quite small, so you can probably support quite a large amount of snails in a small aquarium, given they have enough food. Haha That's great... Gross, but great. 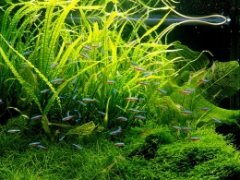 Anyone who has had a MTS sneak in with aquarium plants knows how quickly your tank can go from one or two to hundreds. My old 30 gal crawled with them an hour after lights out.